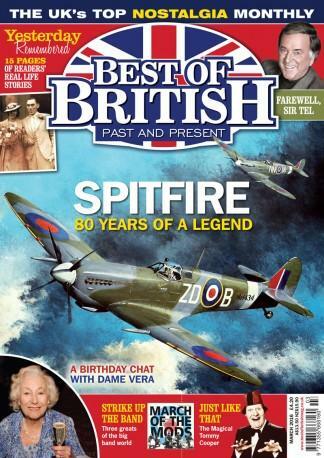 Place a subscription to Best of British magazine and sample the delights of Britain past and present.Best of British is Britain's leading nostalgia and heritage magazine. In every issue of your subscription you will experience and celebrate all aspects of British life - from the 1930's through to today. Packed full of golden memories, Best of British delights everyone passionate about Britain past and present. Places, people, pastimes, jobs and events are all remembered from years gone by - alongside the unique and captivating face of modern Britain. Every page of the magazine is a collectors item, with stories to enable you, a revisit history evoke memories for yesteryear. For those people who want to savour the sweet memories of mighty Britain, this magazine is the best choice. Enjoy every issue and contemplate on the facts that gave British its might.Best of British is a monthly celebration of everything British - from the past through to present day. It is packed with nostalgic stories and pictures every month, with many from our own readers. Remembering all our yesterdays - the music, the school days, the holidays, the transport and the shops of the Forties, Fifties and Sixties. Readers? tales guaranteed to stir so many memories ? what we wore, where we worked, how we were entertained.Subscribe to Best of British magazine today and enjoy the traditions of Britain that have stood the test of time. I purchased a subscription of Best of British for my inlaws who hail from Britain. They love it and have ask that I continue the subscription! That&apos;s their Christmas gift taken care of!